Before we provide a review of online affiliate sites, let’s first briefly discuss affiliate marketing and why it is so popular. 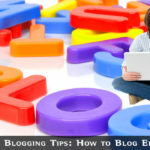 Running a blog is great fun and educational, both for bloggers and their readers. However, it is also time consuming, and like anybody else bloggers like to get paid for their time, even if only to pay the expenses such as web hosting, specialized software, etc. Many others run their website and blog as a business, and if one thing is true in internet marketing, it is that you can never rely on just one source of income. Most successful online entrepreneurs have several different streams of income, many of them passive, meaning that they involve very little personal intervention once set up and running. Affiliate marketing is passive income. Affiliate marketing fundamentally involves selling products for other people. You basically act as an online salesperson, and get paid a commission every time you sell a product. Such commissions can range from around 5% for physical goods to over 70% for electronically deliverable goods such as eBooks and software. These items have no stock replacement cost once one has been sold. Some people set up online stores to market physical goods, while others run adverts on their blog or website for eBooks and software. Each of these can be completely automated. This means that after placing an advert on a webpage. The average payment for eBooks and software is 50%, so if you sell a $49 eBook from your blog, you earn $24.50. 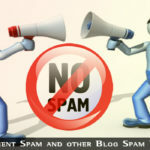 You have nothing to do once your advert is placed on your website or blog. The procedure for physical goods is exactly the same, only prospects are lead directly from your online store to the company you are promoting. Two of the most popular e-stores are Amazon and eBay. Many people set up their own Amazon or eBay affiliate BANS (Build a Niche Store) sites, but this is not recommended. Google no longer tends to rank such stores, likely because they lead the customer straight to Amazon or eBay, and Google does not regard this as providing added value to its users. It is better to promote individual products directly from your blog, or set up mini-blogs to provide descriptions of individual product types and include links from these to the vendors. However, this is not about how you can make money as an affiliate, but intended as a brief introduction to affiliate marketing before we show you some sites that can offer you suitable products to sell. Most affiliate marketing involves downloadable products such as eBooks a software. It’s enough to know for now that affiliates sell products for other people and get paid for doing so. Affiliate marketing is one of the most popular and profitable ways of making money online for most people. If you cannot make 100% by creating your own product, then make 50% by bypassing creation and just selling. Enter into a JV partnership (joint venture) with a well-known internet marketer and sell their product. This can be tricky, because nobody worthwhile will offer you a JV agreement unless you are active in internet marketing yourself, and have a reasonably sized email list of contacts to sell to. 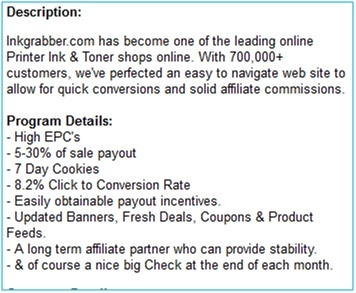 Set up an online affiliate store, whether by using BANS software or by some other means. As previously stated, these are becoming unpopular with Google for its own reasons. Sell individual affiliate products that have been offered to you online. You may even have purchased one, and been given an affiliate link by the seller to sell it yourself. 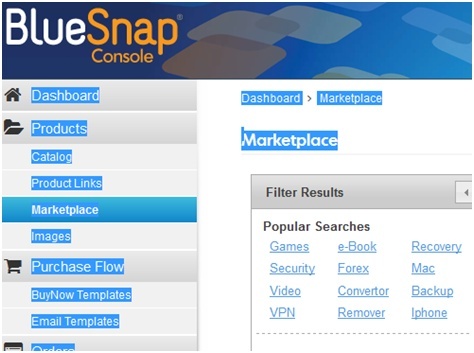 Join affiliate sites and apply to sell available products on your own website or blog. This is the one technique on which we shall focus here. Selling affiliate products is very popular and many people make a great deal of money by doing only this. You can advertise such products on your blog or you can offer them to your email list if you have been building one. You can do both, and keep your valuable list back for new products specific to the niche they are interested in. However, before you can sell products, you must first find them. 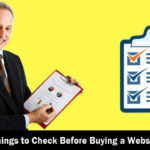 In this post we shall examine a few of the online affiliate sites where you can find products to sell. If your website or blog serves a specific niche, such as health, fishing, quilting, skydiving or even SEO, it pays to focus your products on that niche. You will sell more by doing that. 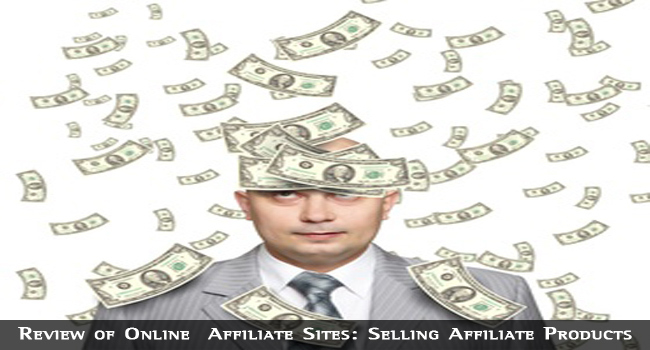 All online affiliate sites operate in much the same way. You must first register with them, then they will display a range of products and their suppliers along with the commission offered. You choose which ones you want to sell, and you will either be approved to sell these or will be rejected. Rejections are often made because your site is considered unsuitable. It might not be relevant to the product, or might be rejected for some other reason. You can often avoid this by checking out the conditions stipulated by the product owner. Once accepted you will often be provided with promotional material such as graphics or even recommended pre-sales pages, along with an affiliate link. Your affiliate link identifies you as the seller, and your commission will be paid either directly or monthly according to the terms and conditions of the program. 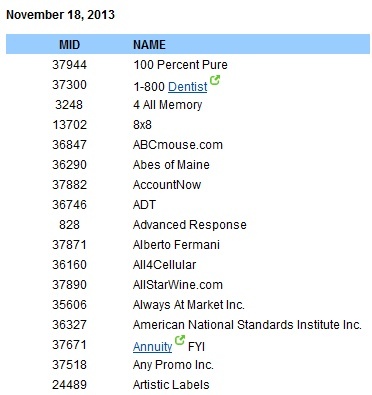 Here is a representative selection of the more popular affiliate marketing sites. You can search for a general niche, such as the above blogging category, or for specific products you want to offer. You can also have your search sorted by such factors as popularity, earnings potential, rebill (recurring billing products) and Gravity (measure of performance – how well it sells). As you can see, affiliates make an average of $81.41/sale, and you get paid 65% of the sales price, and 66% of any recurring purchases. Once you have been accepted by Clickbank you will choose a nickname that identifies you. If you want to sell this product, you click ‘Promote’ and are provided with a box pre-filled with your nickname with space to enter any tracking code you want to use. 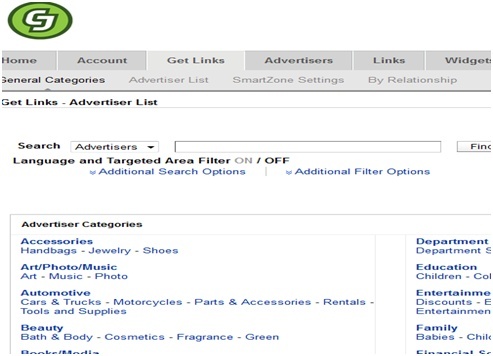 You can use a different tracking code for each location in your site from which you sell this product. Click ‘create’ and you will be provided with your affiliate link for this product. 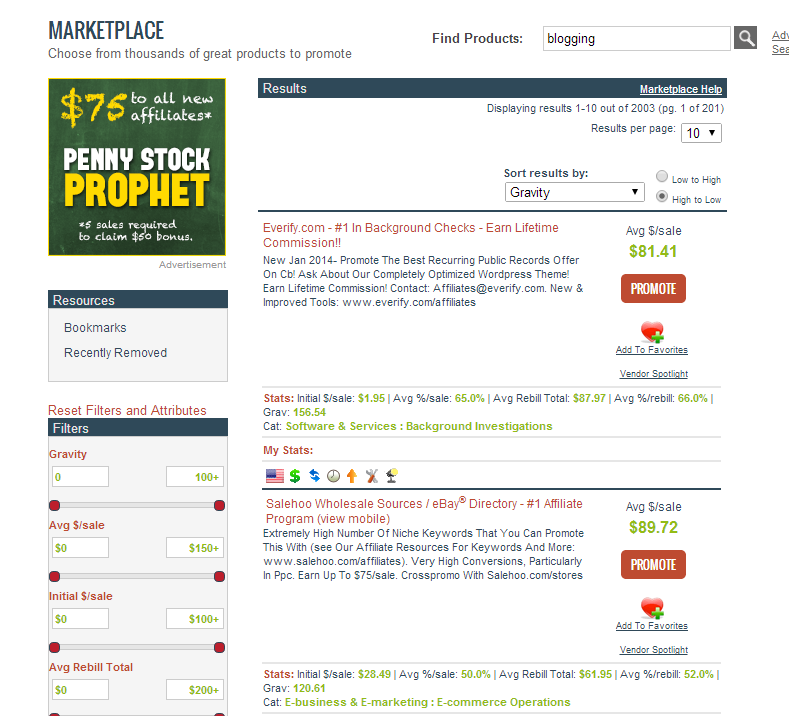 When a visitor clicks this link they will be taken to the vendor’s sales page for the product. If they purchase, your link will identify you as the affiliate and your account will be credited with the payment for the product. You’ll find a 2D barcode image to the right that enables mobile customers to access the product via offline campaigns. 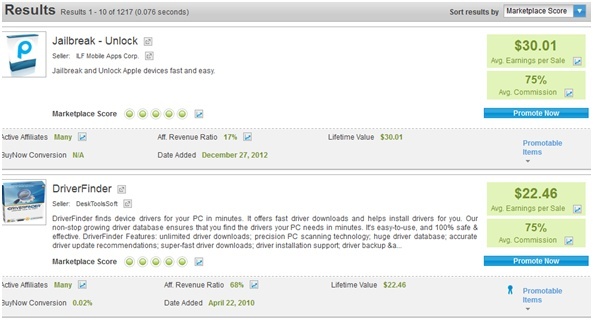 You can promote as many Clickbank products in as many niches as you wish using the one account. You can choose to be paid by check or by direct deposit to your bank. The latter facility is not available in some countries. Commission Junction, more commonly known as CJ, operates in a different way to Clickbank, and includes physical products in its vendor list. These do not pay so well, because the selling price includes a replacement cost which must be deducted before the profit can be shared. This cost is not involved in emailed or downloadable products which can be sold in unlimited quantities without any such replacement cost. If you like this payout, then get the affiliate links to publish on your site. The minimum payment with Commission Junction is $50 and you can choose either a check or be paid by direct deposit to your bank, just like Clickbank. CJ will either manage your affiliate campaigns for you, or you can choose to do so yourself. The former is useful if you just want to select your vendors and then leave it, but you have less involvement and will therefore react less to poorly performing campaigns. Known as Ruketen Linkshare, this is another large repository of companies seeking webmasters and bloggers to help sell their products and services. Registration is easy, and Linkshare offers advertisers that approve all applicants seeking to promote their links and those that check each application individually. Linkshare will also manage your campaigns for you if you wish. When on the site, you can click on any program to find payments and linking details. We shan’t go over this again since the general principles regarding affiliate programs and links is much the same between them all. Clickbank and CJ are typical. Linkshare pays by check or direct deposit. This is an ideal option if you run a blog relate to modern technology, cell phones and computers. Simply get the link that sends your visitors to the vendors site and they will do the rest. You can choose the balance at which your payment is made, with a minimum of $35 or over. TradeDoubler is a Swedish company, and operates much the same as the others. When you register you provide the usual details including the addresses of websites and blogs in which you intend to publish affiliate links. Each must also be categorized using one of the categories provided. You can select affiliate links by using the search form. 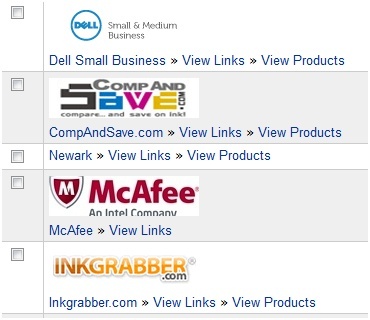 You can search for any specific vendor or company, or carry out a general category search as below. Tariff structure refers to programs paying you per sale, per action (such as completing an online form) or per lead (email address). You can also sort your results as shown. 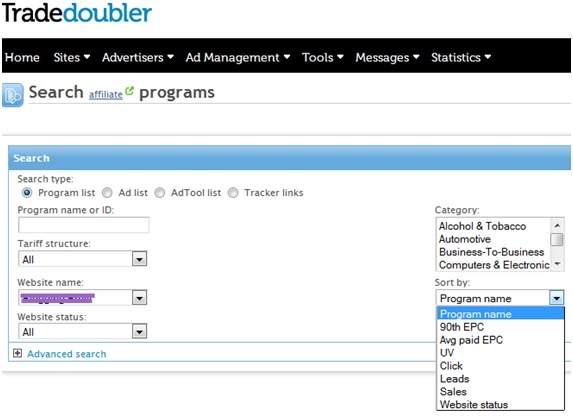 EPC = earnings per click, UV = Unique Visitors. TradeDoubler offers a large number of potential vendors, including many household names. Payments are made directly to your bank account, or where necessary, by international check. Each of the above programs provides you with sales statistics and reports, including full details of sale. Using this information you can contact purchasers afterwards to check whether or not they have been satisfied with their purchase. This type of service is usually well received, although issues are generally well dealt with by the vendor providing the product. They have to be, or their products would be withdrawn from the database. Matching your products with your site is the best way to sell to your visitors or readers. If you can also show them how such products can save them money, time or hassle, then you will do even better. People will pay for a product or service if it is going to save them more than they spend. Online affiliate sites enable ordinary people with ordinary blogs and websites to make money by selling high-quality products. Some make a full-time living doing this while others make enough to pay all their expenses, buy some luxuries or eve pay for their annual vacation. Selling affiliate products is a great way to make money if you don’t have your own product to sell.